We couldn’t celebrate Trails Week without celebrating our trail volunteers. Congratulations to the Mike Levine Volunteer Trail Advocate of the Year Dave Monstrey who has recorded over 1,200 hours with TART Trails; the Mark Mandenberg State Agency Employee Trail Advocate of the Year Roger Storm who is acting Railway Acquisition Specialist for the DNR and co-author of hiking/trail guides; the Non-profit/Local Agency Employee Trail Advocate of the Year Kenny Wawsczyk who is Regional Trail Coordinator for MI’s North Country Trail and coordinates the work of 12 NCTA Chapters; and the Lifetime Achievement Award winner Dennis Pace, who is retiring from Michigan Trails’ board after 12 years of extraordinary commitment to advancing the organization. Kudos to all!! 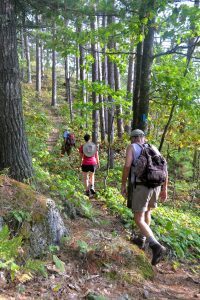 Michigan Trails Week Means Volunteers! This week in Michigan we celebrate all of Michigan trails whether they are motorized, non-motorized, land or water trails and many will choose to concentrate on our status as the number one trails state. 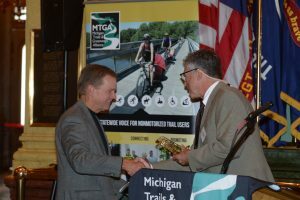 Y et Michigan’s trails should also be celebrated because of the thousands of volunteers across the state who contribute their time and talents to making a system of trails more than simply pathways for recreation and conservation. 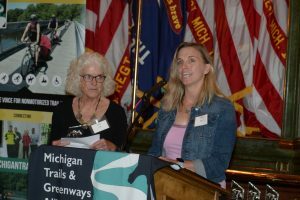 At the Michigan Trails and Greenways Alliance, volunteers are the lifeblood for our organization. When we stage our annual Michigander bike tour, the key ingredient is a stable and committed set of volunteers. When we work to help build trails in communities all over the state, the foundation we look for is a community of volunteers that is passionate about trails. When we advocate for trails policy and funding, we often turn to citizen volunteers to testify in the legislature on why trails matter to them. 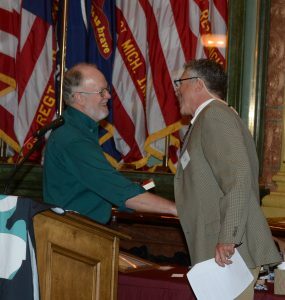 who was concerned that nothing had been done to provide a chance for some work and that it was important part of their journey north to “give back to the trails that mean so much to them.” His persistence and commitment to giving back eventually led to a work effort to enhance the trails we all love. The state trails system thrives on the work of trail clubs, school groups, retirees, “friends” groups, and local and state trail officials who donate more than their work time to our trails. Groups like Paddle Antrim and the Huron River Watershed Council and the Top of Michigan Trails are shining examples of organized groups that are fed by local volunteers. Many times when we can’t find state or federal funding for a trail project, we turn to these volunteers to fill the gaps. 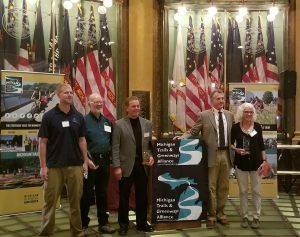 Michigan law recognizes the importance of volunteers by specifically providing for programs like the Adopt-A-Trail, Adopt-A-Stream and Adopt-A-Park programs all designed to funnel the extensive supply of local volunteers who want to give back to the recreation resources of the state. The reason these programs exist is because the state legislature wanted to reinforce the important notion of citizen-steward behavior. We all need to be reminded that the foundation of our government comes from citizen-engagement and that without citizens reaching out to engage in that government, we are left with a hollow and dysfunctional system of governance. 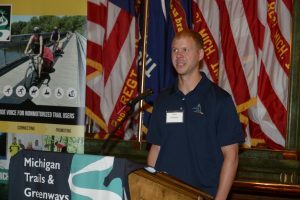 The same formula holds true for our trails and we need to recognize that without these passionate and driven volunteers, Michigan certainly would not be the nation’s finest and most diverse trail state. 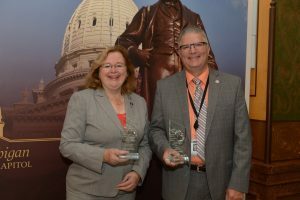 The Michigan Trails and Greenways Alliance’s will host a Legislative Day and Trails Awards Ceremony at 9 a.m. on Thursday, Sept. 27 in the Capitol Rotunda in Lansing. The Calhoun County Trailway Alliance, in partnership with the Chief Noonday Chapter of the North Country Trail, is planning a groundbreaking for a trail accessibility project on September 29 in honor of Ron and Linda Sootsman at 10:00 a.m.on the north side of the Calhoun County Medical Care Facility adjacent to the Calhoun County Trailway. The Calhoun County Medical Care Facility is located at 1150 E. Michigan Ave. in Battle Creek, Michigan. The Trail Accessibility Project will extend the paved section of trail in front of the Calhoun County Medical Care Facility approximately one-half mile south where it enters Kimball Pines Park. The Iosco Exploration Trail will hold a groundbreaking celebration on Sept. 25 for a new trail being built in Plainfield Township, near Hale, which is on the Iron Belle Trail. The EPIC Mountain Bike group will host a Family and Kids Group Ride at 6 p.m. Sept. 26 at Sleepy Hollow State Park to mark trails week. There will be a cookout with family activities after the 10-mile ride. This is a group ride for anyone who is interested regardless of experience or skill level. The term “group” simply implies that you can ride with other people – most people head out in smaller groups based on how hard or easy you want to go on that particular night. 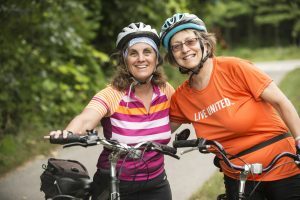 Each week this ride is held at a trail in the Mid-Michigan area (Burchfield Park, Sleepy Hollow State Park, Anderson Park, West Lansing Trails, or the Lansing River Trail).